You can now add images to any of your questions. Select the content tab on your question to upload an image. The image will be shown along with your question in the chat. You can now setup logic for all question types (not just multi choice). To do so click on the “Logic” tab on a question to setup your question navigation. 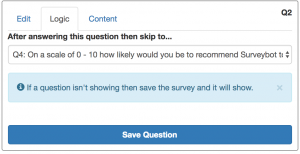 After adding your questions to your survey you may want to re-order them. You can now do this by dragging the “move” icon in the bottom right of your questions. Just like with re-ordering your questions you can now re-order multi-choice options by dragging them in to position. 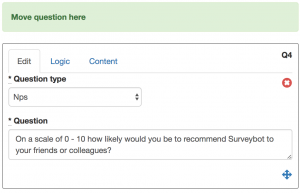 You can now specify behavior for your surveys when someone re-visits. 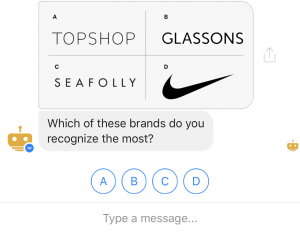 Check out the options when your create or edit your survey details. We’ve removed the finish message box from the survey designer to help with your logic. 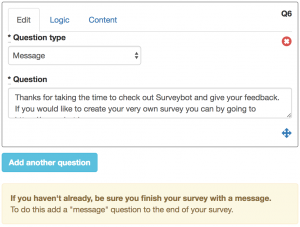 We recommend adding a “message question” to the end of your survey if you want to have a finish message.